A mother had a "good bond" with her 22-month-old daughter and was unaware of her serious internal injuries before her death, a court has heard. Abigail Leatherland and her partner at the time Thomas Curd both deny murdering Eve Leatherland. The toddler died in Liskeard, Cornwall, with multiple fractures and a fatal dose of codeine in her system in October 2017. Ms Leatherland has been giving evidence at Truro Crown Court. The court heard how the 26-year-old mum had been suffering with back pain and tiredness in the week leading up to Eve's death, leaving much of the childcare to Mr Curd, 31. 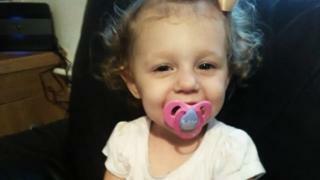 She said Eve had been "very pale, sleepy and was being sick" but thought she was suffering with a viral infection. "I was going to see how she was on Thursday [5 October], see if I could give her something to eat, and if she wasn't any better I was going to try and get her to the doctor," she told the jury. When asked how she feels looking back, she replied: "I know I should have taken her to the doctor, because of how poorly she was. But with experience of viral infections I didn't think she needed to go." Mr Curd, from Watford, and Ms Leatherland met on Facebook in July 2017, and he first visited her in Cornwall the following month. She said she was encouraged because "Eve seemed to click with Tom straight away". She told the court she had never seen him lose his temper in the three months she had known him before Eve's death. She had planned to marry him, and said she "had a good bond" with Eve. Both defendants deny murder and the alternative charge of manslaughter by gross negligence. They also deny causing or allowing the death of a child.